It's back! BERNINA of Richmond/Blue Crab Quilt Co. will be hosting another fabulous BERNINA ACADEMY event May 10th - 11th! We are revisiting our "TAME THAT TECHNIQUE!" theme! 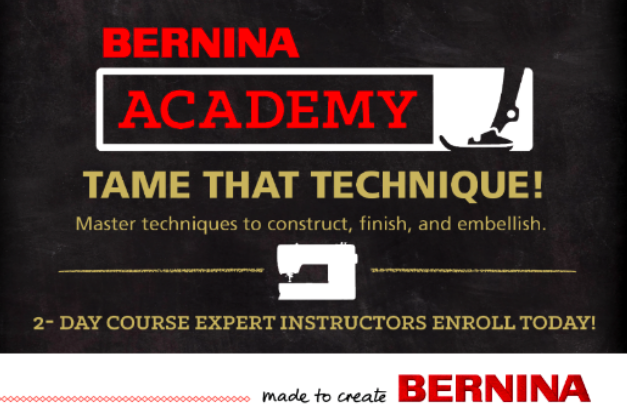 Bernina Academy brings you the best of both worlds! Old School Sewing with a new twist: mix new fabrics with traditional techniques. We'll sew 18 different techniques over the course of two days, including: zipper insertion, pin point embroidery placement, piping insertion, decorative stitching, hemstitching, fringe, and scallop hems to name a few! 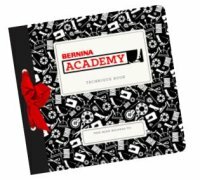 Create the BERNINA Academy Technique Book as you work through the lessons that will be yours to keep as a reference for you to use in your sewing space. 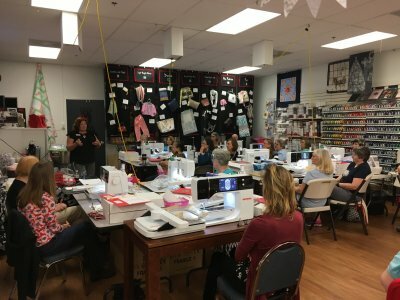 Product knowledge, sewing tips, and free patterns; all supplies, projects, and catered lunches are included in your registration fee for this FABULOUS Two-Day Course. 1) If you can only attend one day, please call to register for a reduced price of $100. Call or email shop for details. Kits, materials, and lunch will be provided. None! Whether you're a seasoned pro or you've never touched a sewing machine you can attend this course. Everyone will walk away with tips and techniques to improve their sewing skills or inspire them to learn and sew more! she and her husband are enjoying empty nesting. 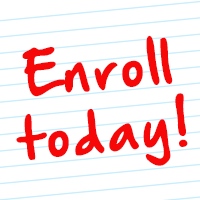 Registrations fee includes two-days instruction, all materials and supplies, Bernina Academy bag of goodies, and catered lunches.